I had some blackberries to use up and this seemed like the perfect recipe. Yum this was delicious! Wish I had hag enough ingredients to have doubled it, but alas not this time! Preheat the oven to 350F. Spray a 8 by 8 inch baking dish with cooking spray. Set aside. In a medium bowl, combine the graham cracker crumbs, melted butter, sugar, and lemon zest. Stir until graham cracker crumbs are moist. Press crumbs into the prepared pan, pressing the crust mixture one inch up the side of the pan. Bake for 10 minutes. Remove from oven and allow to cool to room temperature. Once the crust is cool, combine the egg yolks and condensed milk until well mixed. Stir in the lemon juice and lemon zest. Stir until mixture begins to slightly thicken. Gently fold in the blackberries. Fold carefully so you don’t break the raspberries. 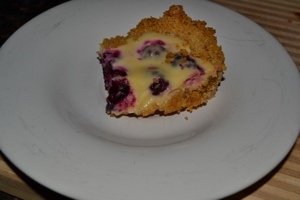 Pour the lemon blackberry filling evenly over the graham cracker crust. Bake for 15 minutes, or until just set. last week my mom came over with blueberries — no one really eats blueberries here — i thought maybe the husband would mix them up with his smoothies.. but alas he didnt! i found this recipe on pinterest.. if you havent been there yet – you should! i read the reviews and all were good! this recipe did not disappoint! 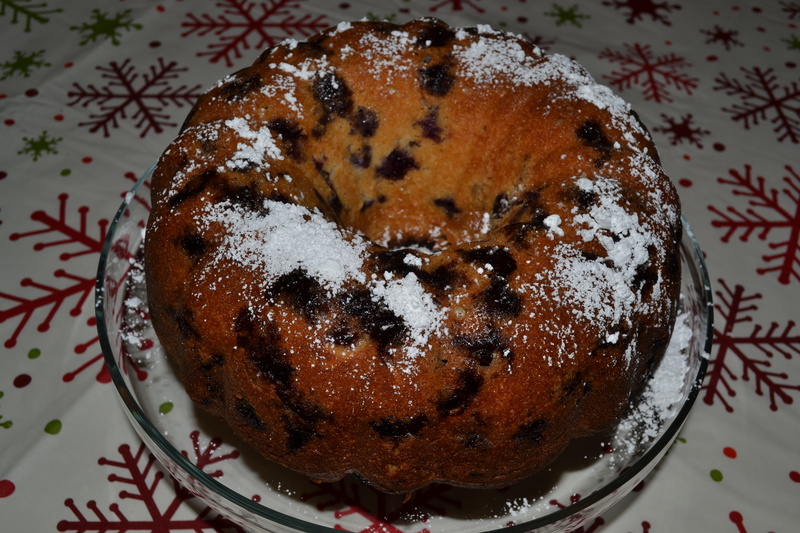 it was delicious and moist and tasty.. YUM go make this! Bake cake on bottom rack of oven until a toothpick inserted into center of cake comes out clean, 60 to 70 minutes. Cool in pan 20 minutes. Invert onto a rack; cool completely, top side up. Dust with confectioners’ sugar before serving, if desired.